local computer, LAN, CD±R/CD±RW, Blu-Ray, HD-DVD, DVD±R/DVD±RW, FTP, and SFTP. 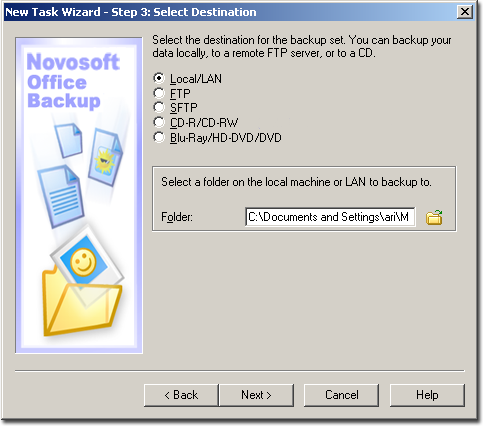 You can select the destination for the backup file/-s in Step 4 of the New Task Wizard. If you choose the first option, Local/LAN, the Browse for folder field will appear in the middle section of the Wizard window. Click icon to find the folder locally or on the network where you would like to save the backup copy/-ies. If you choose to store backup data on remote FTP server, check the second option: FTP. The FTP server settings will be displayed in the window. Enter the host name, the user name and the password to access your FTP server. Click the icon to connect to the FTP server and select a folder for the backup data. The FTP connection window will launch. In this window, choose a folder for the backup data. Click the folder to select it, and then click the Select tab to add this folder as a destination for your backup data. If you were unable to connect to the FTP server, use the Proxy... tab to check the settings of your proxy server. If you are behind a firewall and for that reason cannot connect to FTP server, check the box Passive Mode. The adjustment of SFTP backup settings is very much the same as that of FTP. You need to enter the host name, the user name, and the access password. Then, you should connect to the remote server via SFTP, select or create a folder for the backup data, and select it as a backup destination. For details, refer to FTP. Note: This feature is available in Professional version and in Trial period of either version. Check the CD, if you want to back up to this storage medium. Device: Choose your CD+R/CD-RW device. Folder: Type the name of the folder where you would like to back up your data. Note that the path to this folder should not contain any component names ("component\component\...") with more than 64 characters, or contain one of the following characters: * ? : ; . Speed: Select CD recording speed. Enable spanning (split large backups): Enables spanning - a procedure of saving backup parts onto several disks if your backup set requires more space than is available on a single CD. If your backup set contains large files whose size exceed free space available on a single disk, the program will divide such files into several parts and back them up onto several disks. The file names will look like XXXX name, where X is a hexadecimal digit. Erase disk before writing: Check this item if you need to erase a CD-RW disk before writing a new backup on it. Note: You can either use a blank (brand-new) CD-R/W disk, or erase disks if they were previously formatted with a 3rd party program like DirectCD. Select Blu-Ray/HD-DVD/DVD if you want to back up your data to this storage medium. The Blu-Ray/HD-DVD/DVD recording settings will appear in the lower section of the window. In the Device field, select the recording device, i.e. your Blu-Ray/HD-DVD/DVD drive. Name the folder to which the data will be recorded. Specify the size of your Blu-Ray/HD-DVD/DVD in the Disk size field. Set up the recording speed in the Speed field. Check the box Enable spanning, if the total size of your backup set exceeds the storage capacity of one Blu-Ray/HD-DVD/DVD. The spanning option will divide the backup data into parts and record them to several Blu-Ray/HD-DVD/DVDs. If you use a DVD±RW and there are some data already recorded on it, you can enable the Erase disk option to clean DVD±RW before writing. Check the box Erase disk before writing to do so.